The residents at The Montclair Inn are always filled with pride when they talk about life at the Inn. Since 1990 it has been a residence for independent seniors who enjoy the camaraderie of the small community and the warmth and beauty of the house. One of the most notable features of The Montclair Inn is the fact that residents have prepared meals three times a day. Although breakfast is self-serve, our Head cook plans, shops, and prepares delicious and nutritious meals for our residents every day. When I started working at The Montclair Inn as Executive Director in January of 2015, our Board of Trustees hosted a Strategic Planning session. The priority for the year was to have the kitchen renovated. Therefore, I set out to research for grant funding immediately. Our mission and grant purpose seemed to fit the guidelines that Partners for Health listed on their web site. I immediately sent a letter of intent and we were asked to complete and submit an application. We worked diligently with Kathy Smith, Program Officer for Partners for Health, to submit an application that not only met the requirements for the grantor but also described the needs of the Inn and its residents. In July of 2015, we were elated to win the grant award for $37,000, and planning began immediately to start the renovation. 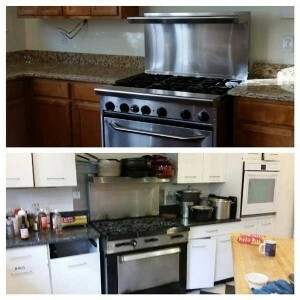 Thanks to the Partners for Health grant we were able to hire our contractor Vescon Services LLC, renovate the kitchen, and purchase new appliances. This kitchen renovation has changed everything about The Montclair Inn. Our cooking staff can prepare meals and clean the kitchen with ease, and our residents and staff have a new sense of pride in the house. We are so proud of our new kitchen and thank Partners for Health and their Board of Trustees for turning our home into a showcase for our residents, staff and the Montclair community.